Following an unexpectedly great day above the clouds on the Muir Snowfield (see other TR), Hannah and I headed south to our next objective: 11,239 ft Mount Hood. The weather forecast for Thursday, April 17, looked nicer farther south, calling for mostly sunny skies and freezing levels around 8000 ft in the northern Oregon Cascades. We hoped that this would be enough to soften the south facing slopes of Hood into fine skiing condition. 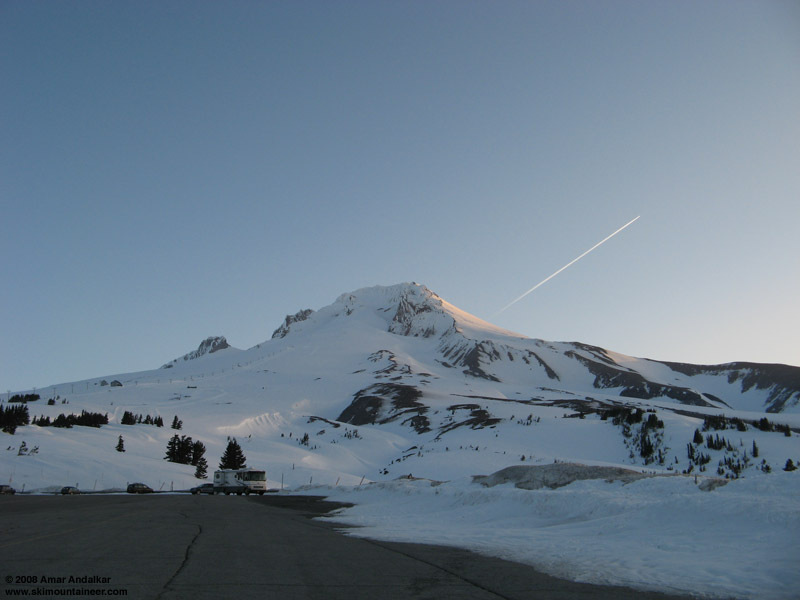 We car-camped at Timberline overnight, driving up out of the sea of clouds on the final stretch of road from Government Camp to a beautiful moonlit spectacle of Hood. We planned a leisurely start in the morning, leaving sometime around 7-8am. We were pleasantly surprised to run into Dan Helmstadter in the Wy'East Day Lodge just before 8am, and invited him to join us. The day was cool and breezy, so there was no rush to head up too early and we finally started skinning uphill around 9:15am. We made quick work of the first half of the trip, gaining the 2600 vertical feet to the top of Palmer Chairlift in about 85 minutes. Skinning up the climbers' trail beside the ski area. Above the groomed runs the snow was firm and somewhat icy, making skinning difficult as the slopes gradually steepened, especially since none of us had brought ski crampons. So the skis went on the packs above about 9500 ft, and we cramponed up on foot the rest of the way. Dan climbing up towards the Hogsback, with the Old Chute visible at top center. The Hogsback on Hood is a semi-permanent ridge of wind-deposited snow near 10500 ft, much like a sand dune, which connects Crater Rock with the northern crater rim which forms the summit. The position of the upper part of the Hogsback shifted several hundred feet west during the winter of 2006-7, and thus it no longer leads to the Pearly Gates as it had for the previous several decades (apparently, the Hogsback was even farther west from the 1920s to 1950s). In conjunction, the Gates themselves now have much less snow deposited in them, making it much steeper, narrower, and more difficult to climb up or ski down via that route. The easiest and preferred route since last season (and now) appears to be the Old Chute, which ascends a broad gully to the west of the Hogsback. The down side is that reaching the true summit requires a traverse east of several hundred yards along the crater rim from the top of Old Chute, with several very narrow sections which are highly exposed to vertical cliffs and steep 50-60 degree slopes on both sides, with a fall of over 2000 ft possible on the north side and perhaps 500 ft on the south. Looking down the vertiginous northern slopes of Hood, with Snowdome and the Eliot Glacier far below. Our pace had slowed substantially above 10000 ft, and we finally reached the summit at 2pm. Temperatures were about 20 F, with a brisk southerly wind gusting 20-30 mph. After a few summit photos and several minutes relaxing, we decided to traverse back to Old Chute on foot instead of attempting to ski from the true summit this time. However, the winds had increased substantially over the brief period since we had summited, and the narrowest and most exposed section was now quite scary. Strong gusts in the 30-40 mph range threatened to blow us off the ridge onto the frozen 50-60 degree steep slopes of the Eliot Glacier Headwall, especially with our skis acting as sails on our packs. Since self-arrest would be difficult or impossible after a fall, we decided the safest method would be to crawl on all fours backwards down this portion of the traverse, thus minimizing the sail effect of the skis.� A few hair-raising moments later, all three of us were safely across, and back at the top of Old Chute. Carefully downclimbing the most exposed section of the summit traverse in high winds. 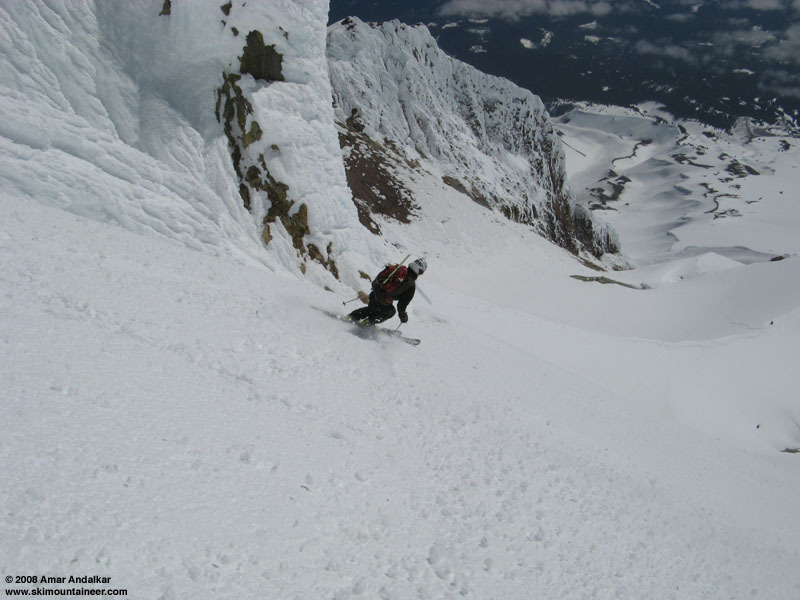 Snow conditions in the upper 200 ft of the Chute had been breakable crust during the ascent, and remained so during the ski descent, making for very difficult turns on the steep 45 degree slope. The crust soon firmed into an icy frozen supportable surface, not ideal but certainly much better than breakable. The east flank of the Hogsback held a nice stretch of foot-deep windpacked powder, which was perhaps the best skiing of the day on the upper mountain. Below Crater Rock, conditions reverted to windswept icy frozen snow until we reached the welcome relief of the top of Palmer Chair and the ski area's groomed runs. All in all, it was a magnificent day with good climbing and great company to reach a prime Northwest summit, despite the less than ideal ski conditions on the upper mountain. Dan carving turns down the icy crust of Old Chute. Hannah skiing the frozen slopes above Illumination Rock. Thanks for tr and pics! Interesting to hear how the locacion of the Hogs Back has shifted. Think Jeff Thomase's out of print book of ascending ("Oregon High"?) Oregon's Cascades etc. mentions historical shifts. So I wonder if the 'shrund' would have moved or is it still in line with P. Gates? 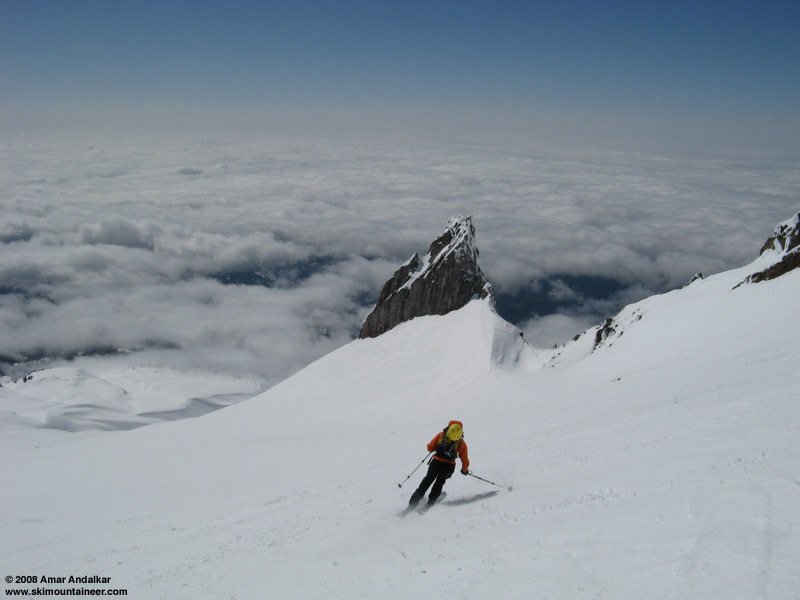 Is there a way to ski off the summit to the right sky line in your first picture, then skiing those couloirs down to the snowfield below, and traversing back? That is the Wy'East route. Access from the true summit requires a very steep exposed traverse. I believe most people approach it from below. The down- climb to the start of W'east from the summit is not too bad as I recall. You can go up to the "crows nest" start, either from Meadows or Timberline too...that fork of to Timberline lodge is a cool slope.